A Disappointing Record: Will the new Human Rights Council take its mandate seriously? When leaders of governments from around the world met in the fall of 2005 at a summit marking the 60th anniversary of the founding of the United Nations, they agreed to a move that had seemed all but impossible in the contentious process of institutional reform: they abolished the discredited U.N. Commission on Human Rights and called for a fresh start with the formation of a new body to be called the Human Rights Council. That was step one. By mid-March 2006, the General Assembly had taken step two: it established the Human Rights Council after barely six months of negotiating. This achievement was due largely to the sharply focused effort of the General Assembly president, Jan Eliasson, a former Swedish foreign minister and ambassador to the United States, who was determined not to let the usual U.N. drift carry this bold proposal into oblivion. The General Assembly resolution declared flatly “that all members of the council shall uphold the highest standards in the promotion and protection of human rights.” The old 54-member commission had become a refuge of scoundrel governments that sought seats more to defend themselves from international criticism than to support human rights anywhere. It was a bundle of entrenched biases, with an agenda pockmarked by glaring omissions. Eliasson had the strong backing of Secretary General Kofi Annan, who had called for the abolition of the old commission in a milestone report titled In Larger Freedom. Annan also had spoken in plain language about how the commission had lost its credibility, was threatening to tarnish the United Nations itself, and why its sins should not be repeated by a new body. The Human Rights Council, which assembled formally for the first time in June 2006, now has more than two-and-a-half years of work by which its record can be judged. For many who care about the universality and impartiality of human rights in both government and nongovernmental organizations, watching the council’s progress has been a deeply disappointing experience. Skimming over the violent collapse of civil rights in Zimbabwe, and barely touching on the culpability of Sudan’s government for the nearly 300,000 deaths in Darfur, the council focused more than half of its seven special sessions since 2006 on the Israeli occupation of Arab territories. 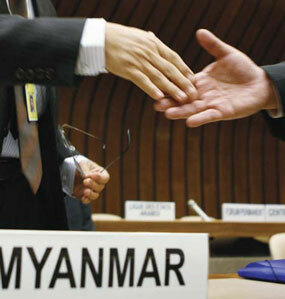 True, Burma (now called Myanmar by its military rulers) did receive attention, with calls to expand the political space. There was also a special session on global food prices and shortages. But the council chose not to consider Tibet, for example, or the mounting toll of official violence against minorities in India. Both China and India are council members. On the council’s agenda for September 2008, only one country was named in advance for special attention: Israel. Moreover, the council is now dealing with the explosive issue of what topics will dominate a conference on racism, xenophobia and other forms of intolerance to be held in Durban, South Africa, next year. Several nations are threatening to boycott the Durban meeting. They fear a sustained assault on the industrialized, ex-colonial “global North” and another on Israel, as well as demands for reparations and special programs for people of African descent, whether or not they were affected by the Atlantic slave trade. By contrast, they fear no demands will be made on behalf of those caught up in widespread slavery and bonded labor in Asia or Africa, which continues. Next year’s meeting in Durban was planned to review actions taken since the first U.N. international conference was held there in 2001 on issues of racism and intolerance. That gathering erupted into acrimonious exchanges when participants decided to revive the “Zionism is racism” language that had been rooted out of the United Nations a decade earlier. The United States walked out of that first Durban conference, as did Israel. The next Durban conference will be a trial by fire for the new U.N. High Commissioner for Human Rights, Navanethem Pillay, a South African who, coincidentally, began her distinguished legal career in Durban as an advocate for political prisoners under apartheid. Her office will oversee the Durban meeting, scheduled for April 2009. Although the Human Rights Council and the office of the high commissioner, both based in Geneva, are expected to work in tandem, they are separate entities; and already there has been friction. A Nigerian, Martin Ihoeghian Uhomoibhi, is now president of the Human Rights Council. Both the promise and the potential of the Human Rights Council are linked to its composition and working methods, as is the disappointing record it is rapidly accumulating. In creating the new body, it was imperative to ensure that the structural flaws of the commission not re-emerge in the council during the give-and-take of intergovernmental negotiations. For greater efficiency and coherence, the governments committed to genuine change wanted the new Human Rights Council to be smaller than the old 54-member commission. They argued that countries should have to demonstrate a reasonable human rights reputation to be elected, as its mandate demands, and should be open to continuing scrutiny as council members. Voting for members should be taken out of the horse-trading arena of the Economic and Social Council. There governments lobby for support in elections to such bodies or to U.N. agency boards, whether or not they have the qualifications to hold whatever seat is being contested. In the past, countries had pressed their perceived right to have a turn at membership on the 60-year-old Commission on Human Rights, and regions saw nothing wrong with awarding known offenders the commission’s chairmanship when they had the chance. Negotiations on the shape of the Human Rights Council were intense. When they concluded in spring 2006, there were losses and gains. The new council, which holds longer and more frequent sessions than the commission, has 47 members—not much smaller than its predecessor. But members were to be elected competitively by winning an absolute majority in secret balloting in the General Assembly, not by backroom deals within geographical regions. Africa was given 13 seats, Asia (which includes the Middle East) also 13, Eastern Europe (including Russia) 6, Latin America and the Caribbean 8, and Western Europe and “other” (sweeping in North America, New Zealand and Australia) 7. The United States, whose delegation in negotiations was led by John Bolton, the ambassador to the United Nations in 2005-6 and a severe critic of both the organization and its principles, played a sorry role in these crucial talks. In keeping with his spoiler record at the United Nations, where he nearly sabotaged the 2005 summit agreement on a range of topics, Bolton raised numerous objections to Human Rights Council blueprints and forced compromises, only to walk away at the last minute, voting against the council and saying that Washington would not seek a seat. While Americans have continued to be observers, the United States lost all rights and opportunities to shape the new body from inside. Friends of the United States are urging a new American leadership with a clean, or empty, slate on human rights, to reverse the Bolton decision and run for a council seat in 2009. Except for one hiatus in almost six decades, the United States had always been a member of the Commission on Human Rights. Louise Arbour, a Canadian judge who was high commissioner for human rights from 2004 to 2008, reflected in an interview earlier this year on what caused familiar problems to resurface in the Human Rights Council, and on how democratic nations failed to avert trouble before it became entrenched. She said that as high commissioner she had urged the new council in 2006 to move beyond the rigid emphasis on regional solidarity that in the past had blocked criticisms of offending governments and allowed them to serve on the commission. She advocated a much more universal or thematic approach, dealing with human rights violations in any given category wherever they occur. Arbour also said that she had asked international blocs of like-minded countries—coalitions of democracies, the French-speaking countries and others—to promote global themes. Yet the only group that followed her advice, however inadvertently, was the Organization of the Islamic Conference. Their fixation on Israel, she said, has become the council’s most consistent motivating theme. It did not have to be that way, she added. Regionalism dies hard. It continues to affect voting for council members. In the June 2008 elections, for example, Africa nominated only four nations for four available African places on the council, a third of whose members are elected each year to prevent a total turnover. While the countries nominated still needed to win a majority of General Assembly votes, there was effectively no slate of Africans to choose from. Latin America also put forth only three nominees for three available seats. Other regions had more nominees than allotted seats. In the case of Africa, a consortium of human rights organizations that pooled existing international surveys of human and civil rights and freedom of expression categorized two of the four nations nominated (and ultimately elected) as “unqualified,” one “questionable” and only one, Ghana, “qualified” to take a council seat. For European, North American and other democracies as diverse as Japan, Botswana, Ghana, Brazil or Mexico, the council should provide an opportunity to demonstrate that there is a universal ethos in human rights that can transcend cultures, perhaps with a few adjustments. It should be imperative that governments seek to join an international conversation not blinkered by regional loyalties, and that thoughtful, even philosophical, minds are assigned to national delegations. Hisashi Owada, a legendary Japanese diplomat who is now a judge on the International Court of Justice in The Hague, spoke with great eloquence about universal values when he was Japanese ambassador to the United Nations in the 1990s. Nelson Mandela’s influence as a defender of rights and a conciliator of seemingly implacable foes was felt worldwide. Such people should set the standard. In the process of bridging cultural gaps, Western human rights advocates may have to rethink some of their absolute insistence since the founding of the United Nations on the primacy of civil and political rights, Arbour said. Much of the developing world—the vast majority of humanity—wants to concentrate first or equally on survival. Persistent demands are made for more attention in U.N. human rights bodies for rights to food, shelter and other immediate needs. A functioning Human Rights Council would be the place for serious examination of how to balance the two approaches. Among 29 “special raporteurs” the council oversees are those who issue tough, even accusatory or incendiary, reports on the rights to education or food, the rights of migrants, the roots of poverty and other issues that might seem more social than political. They document the importance of such issues and tend to find the rich nations culpable of letting down the rest. But it is also true that numerous governments in the developing world have avoided ensuring greater human rights and civil liberties by deflecting the discussion toward social and economic rights. In some cases both civil and economic rights have been degraded. In Zimbabwe, for example, a high standard of living in the breadbasket of southern Africa was destroyed by Robert Mugabe, a dictator with the blood of political opponents on his hands. Amartya Sen, the Nobel Prize-winning economist, has argued that famines do not occur, or rarely occur, in democracies where public opinion matters to governments. Kofi Annan has said that human rights and development are intimately linked. Where do political rights and social rights begin and end, or intersect? The Human Rights Council is the place for that debate. A productive global discussion is also long overdue on the rights of women, an issue that bridges the political-social divide and has been given priority by the new human rights commissioner, Navanethem Pillay. As the United Nations moves toward the 2015 finish line of its ambitious Millennium Development Goals, it becomes clearer each year that without women’s participation in decision-making, economic activity and political influence, most of the goals will not be achieved. Yet in many nations women suffer low social status and enjoy scant protection, even when appropriate laws are in place. Making decisions about matters as basic as family size are often denied them, which contributes to severe poverty from the home to the national level. The greatest achievement of an effective Human Rights Council would be the education and isolation of violators, including those with tarnished reputations who shamelessly seek council seats. Much hope is riding on a new system called universal periodic review, which will be used to examine the records of all 192 U.N. member countries in rotation, at the rate of 16 a year, whether or not they aspire to council membership. (The United States is not due for review until 2010.) Judge Arbour said the system should put all nations on an equal footing, if international panels of reviewers can be impartial. Naming and shaming does not always result in better behavior by governments. But it may be the only weapon the council will have at its disposal, and it must be used credibly. The world mirrored in the Human Rights Council is a 21st-century reality that is not going to change. The developing nations have an unbeatable majority globally as well as in the United Nations, and richer industrial countries will have to work harder at engaging the “global South” in every international forum. Nothing good can come from confrontation, least of all in the Human Rights Council. How could the author have omitted mention of the HR council's election of a representative of Cuba's tyranny as President of its Advisory Board? Indeed, how could she have omitted mention of Cuba while mentioning Tibet and Zimbawe? Is the Cuban tyranny's violation of our human rights for almost 50 years somehow justified, or cool? This article also appeared in print, under the headline "A Disappointing Record," in the December 1, 2008 issue. Barbara Crossette, a former foreign correspondent for The New York Times, writes about foreign policy and international affairs.